Axis Of Oversteer: Grumpy grandpa Schumi sends back soup but not spaghetti. Grumpy grandpa Schumi sends back soup but not spaghetti. In Bahrain it was the lack of a nap Schumacher blamed for qualifying behind Rosberg, in Australia it was blocking. "I could have been fourth" he is reported to have told his team but instead he was seventh, behind Nico once again. Not exactly the return to F1 Der Kaiser was imagining and the increasingly grumpy grandpa, who has been refusing to sign autographs for the fans, showed his frustration when got up in Fernando Alonso's face after qualifying. Out of view of tv cameras but not photographers, he had what what is described "a heated discussion punctuated by hand gestures" and later asked the race director for a "clarification" on blocking. 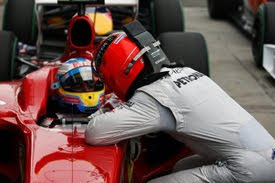 Alonso and Lewis Hamilton, in Schumacher view, were both guilty of not getting out of his way. Schumacher is risking big in starting a polemic with Alonso, this week he was seen again having lunch in the Ferrari motorhome (he either really, really likes the spaghetti all bolognese or maybe he's thinking Massa's contract's up at the end of the year...). If he wants to keep telling Alonso to get off his lawn, he better like whatever they're cooking in the Mercedes tent from now on. I assume Schumacher has a one year contract with Mercedes? At this point would Ferrari take him back? If he starts trying to jump from competitive ride to competitive ride each season then the end of his career might be looked upon very poorly versus having stayed in retirement. Good for Rosberg though, glad to see he's found speed with his car. I think that is about where he would always would have been if he hadn't had an entire team (Inc Ross Brawn) working for him. I never thought he was mega quick but very consistent and I appreciated his ability to build/motivate a team. I'm not surprised Rosberg is beating him to be honest. With all due respect to him, if Schumacher was at Mclaren with Hamilton or Redbull with Vettel the gap would probably be bigger. Only Vettel could attract Ferrari at this point so holding back on Massa either is a lure to try to get Vettel on board soon or it's about giving Massa some time to prove himself and then close another multi-year contract coinciding with Vettel's own contract demands so Ferrari gets him on board in whatever time-frame the German needs. I can't see Vettel going anywhere but Mercedes. But with Newey on form at Redbull I wouldn't be in any hurry to leave. Its only two races into the season. Scheuy has been out of F1 for three years. Testing is so short the first part of the season becomes the testing. I think its too early to count any driver out or in.